I adore decorating with pillows in my home for the seasons. Its quick and can add so much to the season you are decorating. 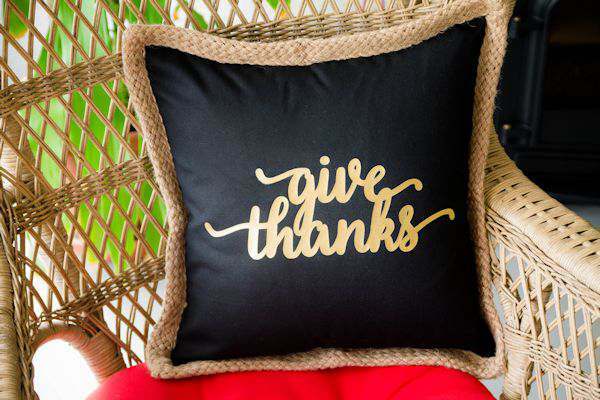 I needed a pillow to remind me of what I am “Thankful” for every day and I thought about a pillow which is seen and a much-needed reminder for myself. 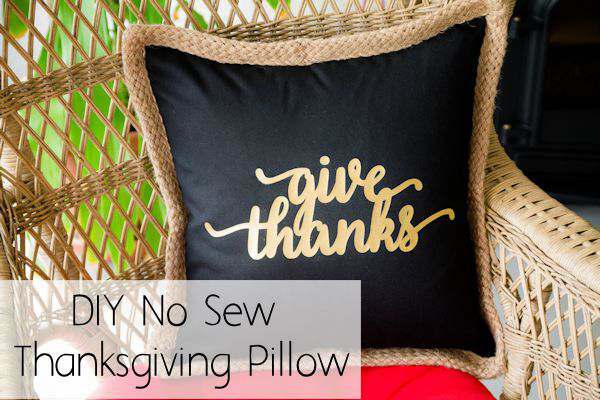 I love making these “no sew” pillows and you can decorate any way you like. You can stencil, paint or use iron-on vinyl like I do. I use my Silhouette cutting machine to cut out my design I made. I used a shiny gold heat transfer vinyl. 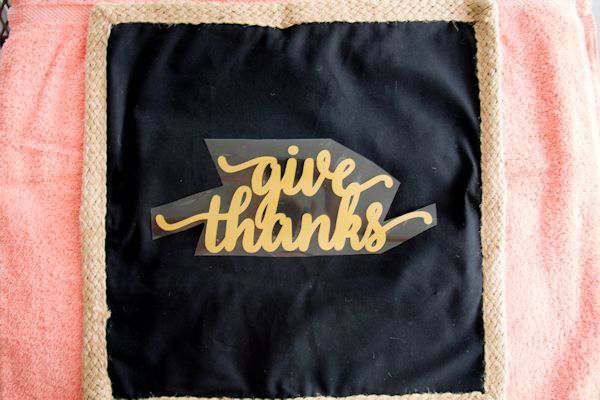 If you don’t have a cutter, you can still use the HTV and just cut out something by using stencils you can buy. There are so many different ways to decorate the front of these pillowcases. 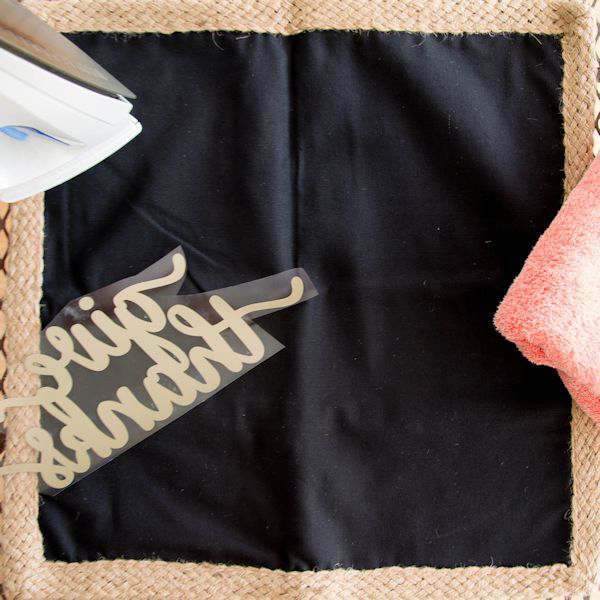 You can also use scraps of material and use fusible adhesive to stick to the material and then to the pillowcase. I use a pillow cover you can find at Hobby Lobby. They come in several styles and colors. Since I already have an 18 x 18 pillow form, that’s the size pillow cover I will use. They are regularly $9.99 for one cover but if you print out their 40% off coupon for 1 regular priced item, that will bring the price down to $5.99. Not a bad price for a decorative pillow. All I needed next was a hot iron, my transfer, and a thick towel to lay the pillow on when I iron. Center the transfer on the pillow and then lay a thin piece of material on that before I press down hard to iron. I have a thin large napkin that I use for this Cheesecloth is another good choice. Follow the instructions on your HTV on how long to iron and what the heat setting your iron should be. Ironing done!! Pillow done!! I just ironed the whole pillow and inserted my 18 x 18 pillow form. I love how it turned out and how the black and gold are so festive this time of the year.